The house was filled with the fragrance of the perfume. The world was filled with the fragrance of our love. Love God, and love your neighbor. Here, although those around him try to make it more complicated, Jesus sees love of God in his anointing, and encourages everyone to love the poor around them continually. This is the Christian life. It’s always a bit abrupt for preachers making the shift from the synoptic gospel for a given year (A, B, or C) to the gospel of John. If preachers are doing their work, they’ve got in mind a kind of narrative context, themes and motifs that, by mid-spring, come to mind with sufficient familiarity that constant referral backwards and forwards into the gospel is less necessary. But since John finds its way into the lectionary only sporadically, in fits and starts, the appearance of a brief reading from the 12th chapter can leave preachers adrift. How much should the congregation be caught up on the context of this text? Are there dangers that they’ll simply think this is a passage from Luke? Does that matter? Well, in this case it really does. For one, the poignancy of this moment taking place at the home of Lazarus just after Jesus had raised him from the dead only comes close if hearers are clued into that previous defining moment (John 11:1-44). And remember, Martha was worried Lazarus would stink if the tomb were opened. Here we have Mary awakening everyone’s olfactory senses in a manifestly startling fashion. It’s like walking into Dillard’s and the perfume counter greets you with a whiff of overwhelming. But let’s be honest. When’s the last time you stopped in and talked to a clerk at a perfume counter at the mall? The folks who work there? They’re nice. They want to help. Often, they really love their job and love what they’re selling. So imagine their surprise if, like those in the house of Martha and Mary, when they offer a free spritz of some perfume named after a fancy actor, the response is, “You should give that perfume to the poor.” You know, sometimes we just get caught up in the sensation of a thing, and sometimes those things can be overwhelming, maybe even flamboyant, gauche, overly grand. We all do this sometimes when we lose ourselves in love. Or in prayer. I work in refugee resettlement. When we talk about resettlement with some people, they say, “You should house the homeless first, or veterans.” Now, I believe it’s important to house the homeless, and provide resources for veterans, as much as anyone else. But they’re not saying that because they’re pouring their heart and soul into homeless ministries. The line is a Judas Iscariot line. It’s a distraction. In this world, there’s enough and more than enough, enough for extravagant love for Jesus poured out in costly nard, and enough to support the poor in their need. Love is always over-flowing like that. · The Five Gospels Parallels, John W. Marshall, University of Toronto. · XXXIX.1-2, 4-11, 15; Tatian's Diatessaron (c. 150-160). · From Augustine's Tractates on John: Tractate 50 (12:1-12). · From the Geneva Notes. · From Matthew Henry's Commentary. — C.S. Lewis in "The Problem of Pain"
"Anointing," Robert Stuhlmann, Stories from a Priestly Life, 2013. "A Lingering Fragrance," Blair Monie, Day1, 2016. "The Prophet Mary," the Rev. Barbara Brown Taylor, Day 1, 2010. "Expensive Oil for His Feet," Pastor Edward F. Markquart, Grace Lutheran Church, Seattle, Washington. 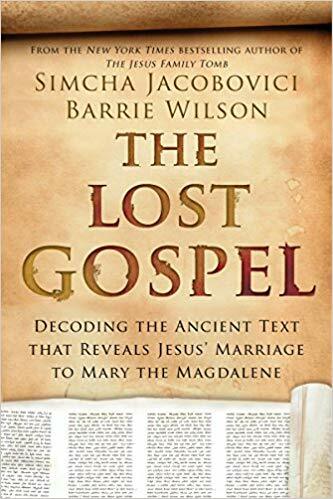 The Dead Sea Scrolls, the Gnostic writings and now The Lost Gospel, a newly decoded manuscript that uncovers groundbreaking revelations about the life and times of Jesus of Nazareth - a startling follow-up to the New York Times bestseller The Jesus Family Tomb.